Wash the turkey wings and dry. Remove the wing tips and save for the stock. Sprinkle the wing mid-section portions lightly with Cajun seasoning. In a large cast-iron pot with a heavy lid over medium-high heat, add the oil. Once the oil is hot, add the 4 wing mid-section pieces. Let them brown on one side and then turn to brown the other side. Remove from the pot and let cool. In the same pot over medium heat, add the diced onions, celery, and bell pepper. Stir until the onions turn translucent and add the garlic. Season the mixture lightly with more Cajun seasoning and salt and pepper. Continue stirring until all the vegetables are browned. Turn the heat off and remove the vegetable mixture to a platter. Let cool. Place the wing mid-section portions on a cutting board and using a sharp knife make a lengthwise incision along the center (do not go all the way through) to open up a cavity. With your fingers, pull the skin and flesh of the wing mid-section to widen the cavity for stuffing. With a spoon, add the vegetable mixture inside the cavity and pull the skin of the wing mid-section to close the cavity as much as you can. In the cast-iron pot, place the stuffed wings on the bottom. Spread the chunks of chopped onions, celery and carrots around in the pot. Add the reserved wing tips. Add the chicken stock to cover the wings and place a heavy lid on top. Place the pot in the oven and cook for 90 minutes without opening. Remove the pot from the oven and uncover. Test the wings for doneness by sticking a fork into the meat and pulling it apart. It should be fork tender. Remove the wings to a platter and keep warm. With a slotted spoon, remove the vegetables from the pot. Place the pot containing the gravy on the stovetop over medium heat. Make a slurry by combining cornstarch and a little cold water. Stir half of the slurry into the gravy and bring to a boil. Add more slurry to thicken, or water to thin. Once the gravy reaches the thickness you want, turn off the heat. Season to taste with salt, pepper, and hot sauce. 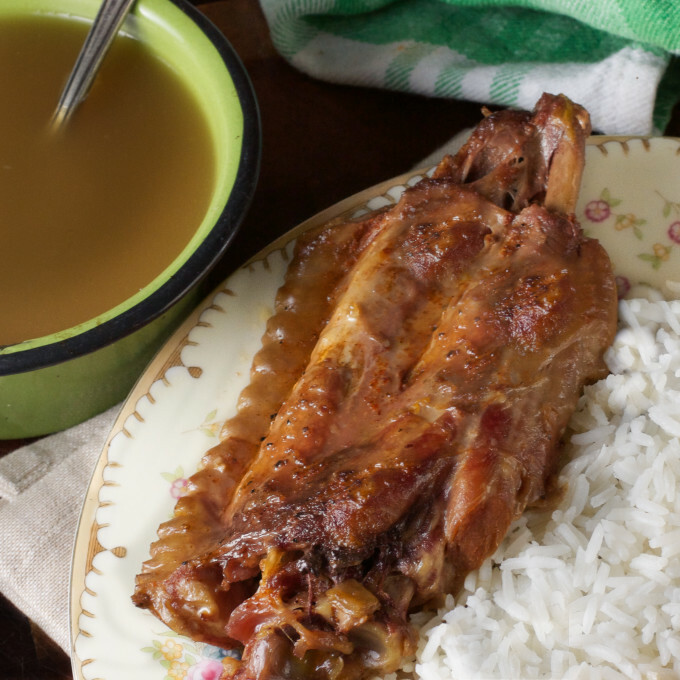 For serving, add a mound of rice in the center of a plate and place a stuffed wing on top. Spoon the gravy over and serve any extra on the side. Serve with sweet tea and yeast rolls. Trim off the wing tip but include it in the braising liquid for flavor. One of these wings per serving is more than enough when topped over a mound of white rice, but you just might be tempted to have two. The slow braise makes a terrific gravy so make sure to use plenty of stock.